Hotel lot, please ask a staff member / hostess for a complementary parking pass. 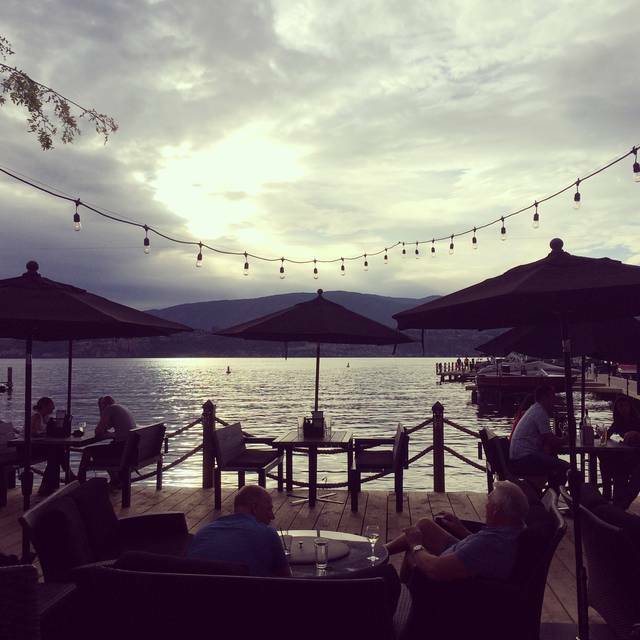 Friday nights are legendary at the Hotel Eldorado Lounge, join us lakeside for signature cocktails, share plates and enjoy the best Okanagan wine selection in the valley. Ask the locals, The Hotel Eldorado Lounge is the place to be Friday night in Kelowna. Ordinary meetings become extraordinary events lakeside at the Hotel Eldorado. The Sunroom and Greatroom are both perfect venues for large receptions, presentations, business meetings, group dinners, weddings, and private parties. Our Boardroom, Mountainroom or Lakeroom are excellent for conducting business meetings, seminars, training sessions or private dinner parties. Whatever your needs are, our professional catering and banquet team will elevate your next function. Enjoy sunsets and sweeping views of Lake Okanagan in the Sunroom, Veranda, Greatroom, Terrace, or the Southern Exposure room. An evening spent in the Hotel Eldorado's award-winning Lakeside Dining Room will be an evening to remember. The Eldorado strives to take advantage of the Okanagan's bounty of seasonal and organic products provided by local suppliers. 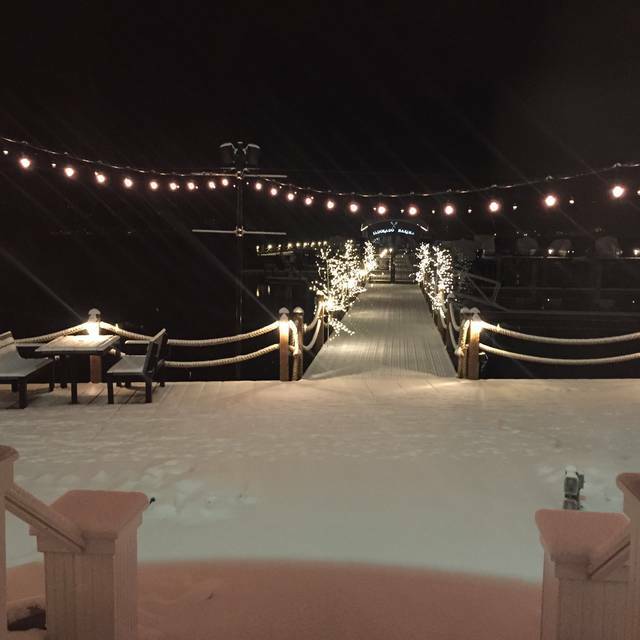 Boasting fantastically prepared AAA Angus beef selections, fabulous chops, great seafood and an award-winning wine list featuring over 150 different labels - Nothing beats dining lakeside at "The El." This restaurant sits on the water overlooking a Marina. It has old world charm that is reflected in the beautiful linens, cutlery, and stem-ware. It is a classic setting with excellent service. We shared the mussels appetizer which was more than enough for two. Heather our wait-staff was very attentive but not over-bearing so we could have a good visit with our lunch dates. I will return. 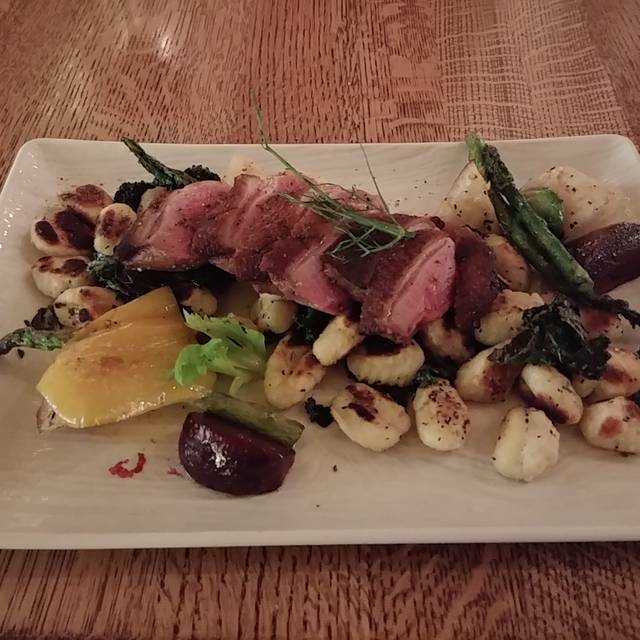 Food was excellent, server was very knowledgeable and attentive. Nice view of the lake and ambiance was conducive for a conversation. Portions were quite small, especially the appetizers, but the flavours were fantastic. Great service and care to customer. Very much enjoyed tonight. Fantastic food and great wine list for all tastes. Server was very personable and made a fabulous recommendation for wine. Love the Eldorado! The setting is beautiful with the lake in the background. The dining area was quiet and relaxing. The service was unbelievable... the server (Heather) was knowledgeable and friendly. It was a lovely way to spend Valentines! We had a reservation for 7:30 but my husbands plan arrived late. The ladies at the front desk where so amazing and made it work for us even though we were late. The dinner was spectacular! As noted, overall we were very pleased. We had enjoyed dining there previously with out of town friends and they too rated overall as excellent. Suggestion for what it is worth. I had the Fish & Chips (single) and felt the serving was far too much. Fries took up 3/4 of the plate, and while this is only a potato it is a shame that soo much goes to waste over the period of a year. Perhaps a few less fries, and less going into the land fill, otherwise keep doing what you are doing, including keeping the most pleasant serving staff. Our server Jared was great! Attentive but but not intrusive. He was very knowledgeable and friendly. The food was good, not great. Nice quiet atmosphere but not stuffy quiet. My husband and I had our anniversary dinner here. Our server, Vincent, was friendly and knowledgable and made our evening feel quite special! The food was delicious and though the prices are on the higher side, it’s totally worth it for the quality of the meal. Overall a great experience! Upscale dining is rarely in our budget, but my husband and I received a gift card for Christmas, so off we went! It was Jan 2, so the dining room was empty, and we had the full attention of our server, who told us the history of the hotel. Although most of the original structure has been replaced, it retains an air of 1930s elegance, and many vintage photos are displayed. Prices were high, but the food was delicious and portion sizes were satisfying. I was impressed by the way our wine was poured: with a formal introduction and a flourish! It was a special experience. For $89 on New Year's Eve, price didn't reflect well with our meals. Portions were just ok. Everything was luke warm including the consomme that was added from a tea pot right at the table so it should've been hot. My Beef Tenderloin was inconsistent with the doneness. It went from medium rare to blue rare and again luke warm. I had ordered it medium rare. My girlfriend's breast of duck was greasy and tough. It was my fault for not asking the price of the Sunday Brunch but $94 for 2 people is way to expensive. It would've been included with our New Years Eve package but the sales department hadn't had it organized till after the 1st of December. Were expecting the same amazing Singer/DJ as last year but unfortunately it was a regular DJ and again the $50 per person did not warrant it. On the great part, all staff were very friendly and the Beds and Pillows are to die for! Unfortunately, we will be looking for a different venue next New Years. I booked on line. At that time, there was a link to the Menu. I checked it and it was the standard menu. Somewhat expensive but OK for New Year's Eve. A day or two before our dinner, I received an email reminder, again with a link to the Menu. I checked it and it was the same as previous. Upon arrival, we were presented with the New Year's Eve special menu which provided limited choices for a three course dinner at a cost of $89.00 plus plus per person. Considerably more than we had planned to spend. I asked for the standard menu and was told it was not available. The food was pretty much a bust. The appetizer was lousy, the main course was so-so (we had beef tenderloin. 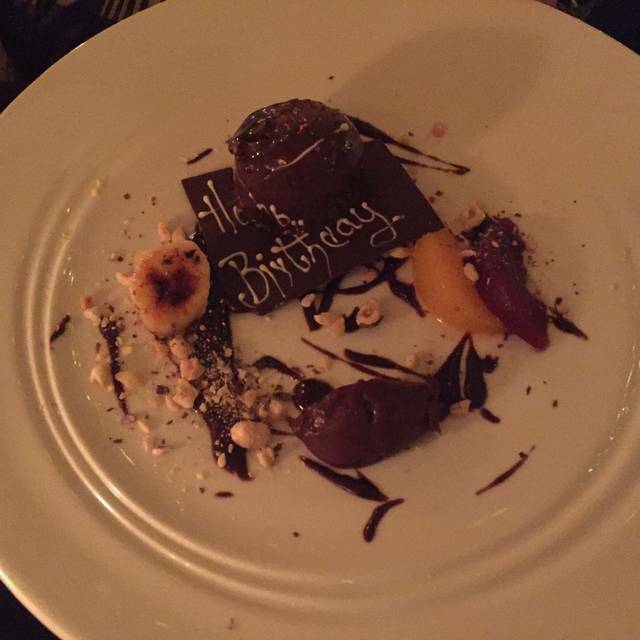 My wife's was good, mine was full of gristle), the desert was excellent. The service was excellent. Noise level was high. The price of wine was out of this world. 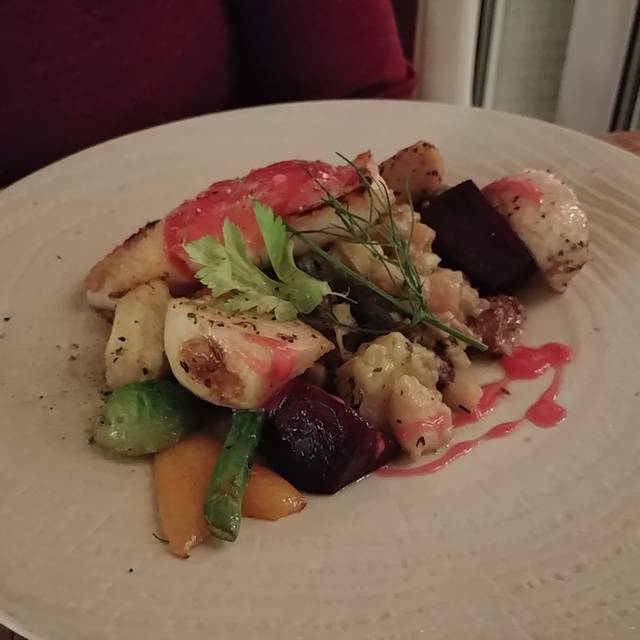 One of the most beautiful and cozy restaurants in Kelowna, with great quality food and amazing service! Way over-priced. A skimpy Caesar salad was $16.00 when it should have been $9.00. The vegetarian option on the menu was quite poor in taste. Very clean and comfortable. Location was excellent. Good options in the menu but prices are high even for a fine dining restaurant, flavour and presentations were standard for most restaurants, it was nothing really amazing, just good. Sub par service for a fine dining restaurant. We ordered wine, and the supervisor/manager poured the glass without a wine description. Our server was not attentive. Saturday night dinner out. 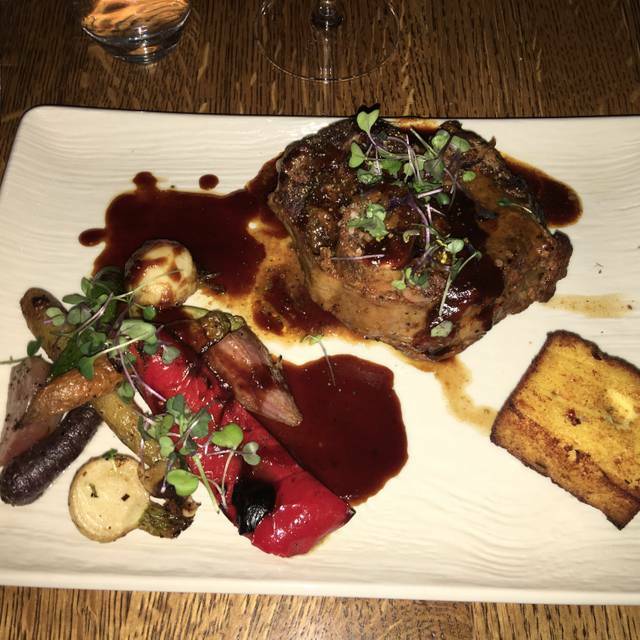 Had the Lamb Sirloin with a glass of Oculus and my wife chose the Rossini (beef tenderloin topped with Foie Gras) and paired it with a glass of Note Bene. This truly was a meal to remember, love the fact that you can have a glass of high caliber wine without having to buy the bottle. The restaurant and lounge have a really relaxing atmosphere, cool, laid back and sophisticated. Love the place, never disappoints. Lovely meal, the chefs take on surf and turf was awesome. Treated very well by our server. Great place to celebrate an anniversary. Outstanding meal all around. Service, food, atmosphere, music all combined created an unbelievable dinner with friends and colleges. Okanagan wine selection is outstanding. Will definitely return again and again. Elegant but relaxed . Value for money . Book early . Fabulous evening with friends. Great food, attentive waiter, wonderful view and we could hear each other talk!! Perfect. As always the Eldorado is in a perfect location with excellent food and service. The noise level in the dining room was unbearable. Two larger tables were in full swing competing with each other to be heard. With the patio doors closed it was impossible to have a romantic date with my wife. Always a lovely spot to have a meal. 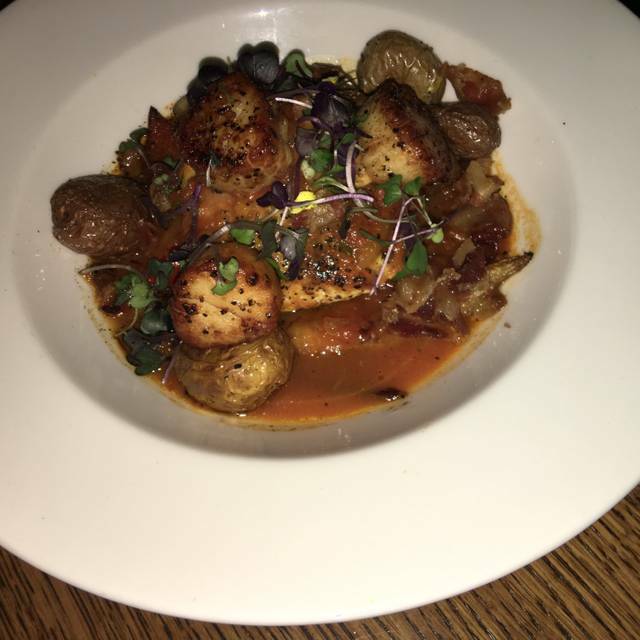 Our server, Jennifer, was knowledgeable, attentive and very personable. The El Dorado location provides guests with a million dollar view, no wonder it has been around so long. It was my birthday and they never made mention of the occasion once. The food was very poor quality meat cuts that you would not even be expected at a cheap steakhouse!!!! Dinning area with lots of character providing a view of the lake and marina that created the perfect ambiance for our occasion. Knowledgeable server that guided us to our best meal of our sejour in Kelowna . Booked for dinner to celebrate 47th Wedding Anniversary. Ordered a virgin Pina Colada, and bar didn't have coconut milk. If customers were important, someone could go to store and purchase. Our server was very good, but he got little support. The wrong meal was delivered to our table. Had to wait for my meal to be prepared. A bit later, saw the meal delivered to a neighbor table, Not much class. Dining right on the lake! Excellent food and service. Wear big spray if dining at night as the mosquitos are hungry! Double edged sword of waterfront dining. Will return on next trip to Kelowna. Outstanding service in every way. Exceptional food. The most beautiful Okanagan setting possible. Highly recommend!!! the menu was different then what is shown on open table and $2 more per item as well. service for beverages were slow but overall service was great. always enjoy the nice view though. Hope the menu selection improves. Lovely setting, right alongside lake. Food and service were very good. Wish breakfast was served late on Saturday. Ambience and service were good. Menu is limited and relatively expensive. The appetizer and dessert we shared were amazing - a wonderful way to start and end the dinner. The main entrée was also delicious but it was the scallops at the start and the green tea cheesecake at the end that we were still talking about the next day. My husband & I were there for an anniversary dinner and enjoyed it very much! From the view, to the service, to the food - everything was outstanding! Interesting menu, very good food, excellent waiter and service staff and a nice view. But it was noisy, too noisy for a conversation. Would return in the summer when outdoor seating is available, might be quieter?